Slugger is a fun book for second grade level readers. It appeals to both girls and boys and tells a great story about baseball. The twist is the characters are bugs and slugs making it even more fun for the second grade reader. The benefit for the second grade reader is that the story also tells about teamwork in a fun way. This makes Slugger a great addition to the second grade classroom library. The book makes an extra fun way to add team work into the curriculum when talking about character education. Teamwork is one of the goals of Slugger but the book also shows the characters are not perfect and some of them want to quit. The story does a great job of showing how practice helps the bugs to improve at baseball and that quitting is not an option, another great way to open discussion with readers about character development. 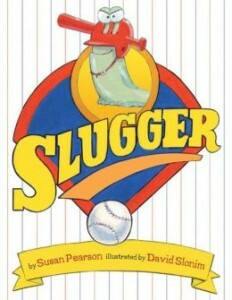 Slugger is an excellent book to include in the classroom or school library. The language is written to be mastered by the second grade reader but it is also written to be read aloud to younger readers. The illustrations are so fun and the bugs and slugs are shown in all kinds of interesting baseball situations that the reader can’t help but laugh and enjoy reading the book over again. Any book that challenges the reader while also entertaining is a plus for second grade readers. Even reluctant readers will love the story, illustrations, and the characters from Coach Roach to Locust Lou. Second grade level readers will benefit from this book in the classroom.